From left to right: Chief Minister of the Australian Capital Territory Andrew Barr, Vice President for Research Laurie Locascio, and Professor Shirley Leitch, Deputy Vice-Chancellor for Global Engagement at ANU at the signing ceremony for the ANU-UMD partnership. 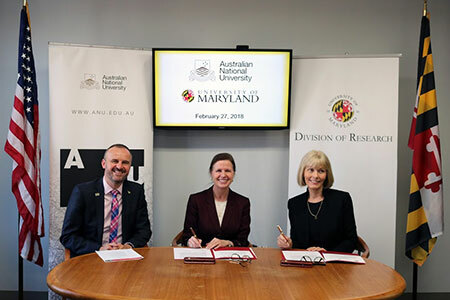 Australian National University (ANU) and the University of Maryland, College Park (UMD) have announced the establishment of a partnership agreement between the universities aimed at promoting mutual engagement, cooperation, joint projects and research activities, and faculty and student exchange. Senior officials from both universities gathered at UMD's College Park campus on February 27 to sign the agreement. "International collaborations are increasingly important as we aim to deliver research-based solutions to complex, global problems," said UMD Vice President for Research Laurie Locascio. "We are very pleased to establish this partnership with Australian National University and look forward to continued teamwork and knowledge exchange between our universities." "Collaborating with the University of Maryland will increase our research quality and impact," said Professor Shirley Leitch, Deputy Vice-Chancellor for Global Engagement at ANU. "Both universities are investing in areas of strategic priority for our nations-such as cybersecurity-and this new agreement will support and drive future research, innovation, and skills development." 5)	cooperation between professional staff. The five-year agreement will spur collaboration across a variety of research areas, with potential opportunities for joint efforts in fields such as cybersecurity, energy, arts and humanities, social sciences, health and medicine, environment and sustainability, engineering and computer science, and many other disciplines. As a precursor to the partnership, UMD representatives visited the ANU campus in August of 2017 through the Borderless Research Administration Knowledge Exchange (BRAKE) program developed by UMD's Division of Research. BRAKE is an administrative training program that focuses on engaging international institutions as strategic cohorts, helping them to build expertise in research organization and in the management and oversight of U.S. federal funding. The UMD BRAKE team's visit to ANU helped generate discussions about opportunities for collaboration between the two institutions and helped lead to the partnership agreement. For more information about BRAKE, visit: research.umd.edu/international. To see photos from the signing ceremony, visit: go.umd.edu/umdanu. The Australian National University is a national research university located in Canberra, the capital of Australia. Its main campus in Acton encompasses seven teaching and research colleges, in addition to several national academies and institutes. Founded in 1946, it is the only university to have been created by the Parliament of Australia. Originally a postgraduate research university, ANU began offering undergraduate programs in 1960 when it was integrated with Canberra University College. ANU enrolls 10,052 undergraduate and 10,840 postgraduate students and employs 3,753 faculty and staff. ANU is ranked 1st in Australia and the whole of Oceania, 20th in the world by the 2018 QS World University Rankings, and 47th in the world (second in Australia) by the 2016/17 Times Higher Education. ANU was named the world's 7th (first in Australia) most international university in a 2017 study by Times Higher Education. In the 2017 Times Higher Education Global Employability University Ranking, an annual ranking of university graduates' employability, ANU was ranked 21st in the world (first in Australia). The university is particularly well known for its programs in the arts and social sciences, and ranks among the best in the world for a number of disciplines including politics and international relations, social policy, and geography. ANU counts six Nobel laureates and 49 Rhodes scholars among its faculty and alumni. The university has educated two prime ministers, 30 current Australian ambassadors and more than a dozen current heads of Government departments of Australia. For more information, visit: www.anu.edu.au. UMD is one of the preeminent public research universities in the United States and a global leader in research, entrepreneurship and innovation. UMD's faculty includes two Nobel laureates, three Pulitzer Prize winners, 56 members of the national academies and scores of Fulbright scholars. Founded in 1856, UMD has over 38,000 students and 352,000 alumni, all dedicated to the pursuit of Fearless Ideas. Located just outside Washington, D.C., UMD discovers and shares new knowledge every day through its renowned research enterprise and programs in academics, the arts and athletics. UMD is committed to social entrepreneurship as the nation's first "Do Good" campus. The university secures more than $500 million annually in external research funding, with a $1.9 billion operating budget. UMD is a member of the Association of American Universities, the Big Ten Conference and the Coalition for Access, Affordability, and Success. For more information, visit: www.umd.edu.